This project provides an opportunity for mutual learning between six European countries, three of which are already successfully using restorative justice practices with children (the “mentor” partners – Belgium, Finland and Northern Ireland), while the other three are in the process of implementing observed restorative practices as part of a monitored pilot project (the “mentee” partners – Bulgaria, France and Latvia). The mentor and mentee countries are paired in duos, each focusing on a specific restorative justice method: Belgium mentors France in the implementation of mediation in serious cases, Finland mentors Bulgaria in the implementation of mediation in less serious cases, and Northern Ireland mentors Latvia in the implementation of youth conferencing. Each mentor partner organises a field visit in order to allow the exchange of good practices, to provide a learning experience and to create a space for synergies and teamwork among the partners. 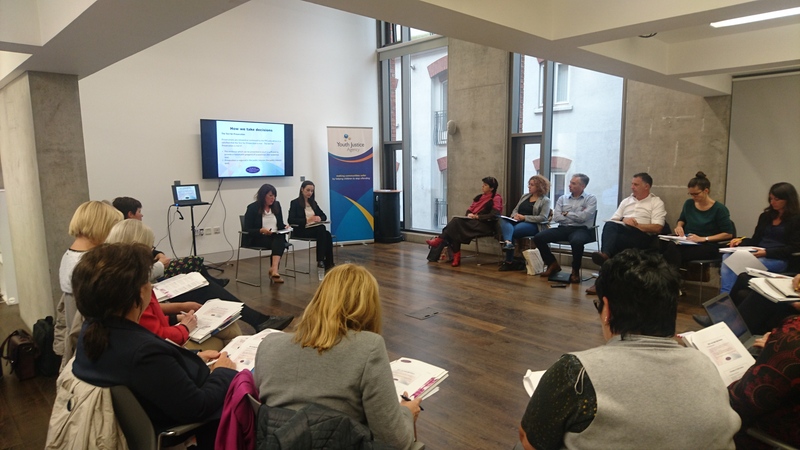 Within this context, the Youth Justice Agency of Northern Ireland hosted the second field visit, welcoming all the mentor and mentee partners of the project to Belfast, Northern Ireland. On the first day, Declan McGeown, Chief Executive of the Youth Justice Agency, opened the visit and welcomed the participants, thanking them all for their attendance and willingness to learn from Irish experience regarding youth conferencing, and expressing his hopes for a fruitful exchange of information between the project partners. The introduction was then continued by Silvia Randazzo, Project Manager at the IJJO, who gave an overview of the current status of the project and the general development of its implementation, and shared updates about its activities and next steps. This was followed by a further specific update from each of the partners, who also raised questions and issues to be tackled in the course of the field visit. These were recorded by Ms Randazzo, with the objective of taking this opportunity to brainstorm, find solutions and identify clear outlines for the next steps of the project. Raising the main theme of this field visit, Tim Chapman and Hugh Campbell of the University of Ulster presented an overview of restorative justice in Northern Ireland, providing the participants with an historical and social background of the development and spread of the practice of youth conferencing. Kevin Doherty, Assistant Director of the Youth Justice Agency of Northern Ireland, then discussed general issues of implementation and policy regarding youth conferencing. To begin the second day, Ian McEachern, a Youth Diversion Officer from the Police Service of Northern Ireland, gave a presentation on the main aspects of his role. Linda Chambers and Ciara McMeekin, prosecutors from the Public Prosecution Service of Northern Ireland, then discussed the role of the Youth Specialist Prosecutor, giving a thorough overview of the legal framework of diversionary options in Northern Ireland and the principles of diversionary youth conferencing. They also presented a case study to clearly outline the role of the Public Prosecution Service in youth conferencing, and how the decision-making process works. This was followed by a presentation on preparing both the young person and the victim for a restorative conference from Julie Wilson and Gary Halliday, Youth Conference Coordinators from the Youth Justice Agency of Northern Ireland. They also conducted a youth conference role play, which was followed by a debrief and an opportunity for participants to ask questions. The second day was then closed by George Conner, District Judge in Belfast, who presented a judge’s perspective on restorative youth conferencing, discussing a sensitive and child-friendly approach and emphasising the importance of the principles of proportionality and the best interest of the child in youth conferencing and in the judge’s decision-making process. The final day of the visit began with a presentation from Colleen Heaney, Assistant Director of the Youth Justice Agency of Northern Ireland, on working restoratively with young people who commit offences involving harmful sexual behaviour (HSB). Carrie-Ann Rafferty, Youth Conference Coordinator of the Youth Justice Agency of Northern Ireland, then presented a case study of a HSB offence committed by a young person against a young victim, that was dealt with via a youth conference. The second field visit concluded with a final session led by the IJJO, including a debrief and an opportunity for discussion. This focused partly on the next steps of the ‘Implementing Restorative Justice with Child Victims’ project, which include the next field visit and training session in Belgium during the week of the 6th of November, and partly on providing answers to the questions raised during the IJJO-led session on the first day. After presenting the aims and timeline for the project’s next activities, Silvia Randazzo, together with Tim Chapman and Hugh Campbell, carried out a needs-assessment exercise with the mentee partners, in order to ascertain their specific priorities in terms of training needs, in preparation for the next project field visit in Belgium.